As unbelievable as it may seem, the infamous fibbing gambler Pete Rose and the blustery “non-politician” (and presumptive favorite for the Republican nomination) who was so good at lying he made a business out of it and then lied about that have found themselves at odds about the truth of a matter. Like most fierce debates these days it has to do with baseball. More specifically, the issue at hand is the provenance of a particular baseball, evidently signed by you-know-who and given to the-other-guy. Or was it? According to Pete Rose’s attorney’s statement to the media, the baseball has presumably appeared out of thin air. “Pete has made a point not to ‘endorse’ any particular presidential candidate,” [Ray] Genco wrote. One thing is for certain. Pete Rose is definitely a man who regularly converses with his attorney. 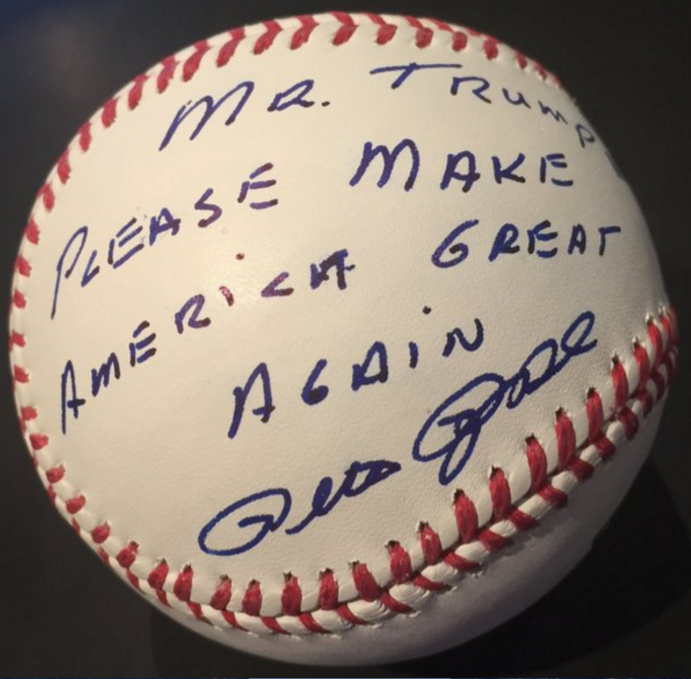 Whether or not Rose (or a Rose-authorized signature surrogate, or an attorney, or whoever) was behind the autographed baseball is, politically-speaking, immaterial. For one, surely no one could work themselves up to caring about what a totally irrelevant baseball player (a would-be Hall of Fame player, but still) thought about the Presidential race. If anything, we might be inclined to go the opposite way of the man with some of the most demonstrably poor decision-making skills in history. But more importantly, this guy has proven time and time again that he will say anything for attention.